Brooklyn’s very own 10 Deep has made a name for themselves this past year, but not just in the threads world. They’ve dropped two mixtapes, one for Wale, which cemented his position in the game as a….beast! The other for up and coming star Kid Cudi, introducing him to the mainstream and now dude is on Kanye’s album and being played at disco-techs all over the world. 10 Deep is now finishing up a big year in style, (pun intended trick!) 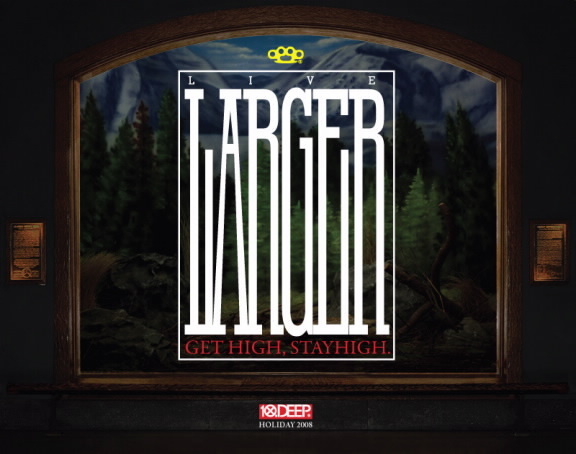 with a new Holiday Collection entitled “Get High, Stay High.” Apparently they were inspired by Night At The Museum mixed with Alive and Deliverance, which gives this collection an outdoorsmen type of feel, consisting of flannels, bubble vests, sweaters and much more. Get High, Stay High is shipping now and will be in stores on December 11th. Get that son! Previous PostSTOP! Drop and Listen to P. Casso’s Audio ArtNext PostQuestion: How Famous is Famous Now?